This is the cutest craft ever. 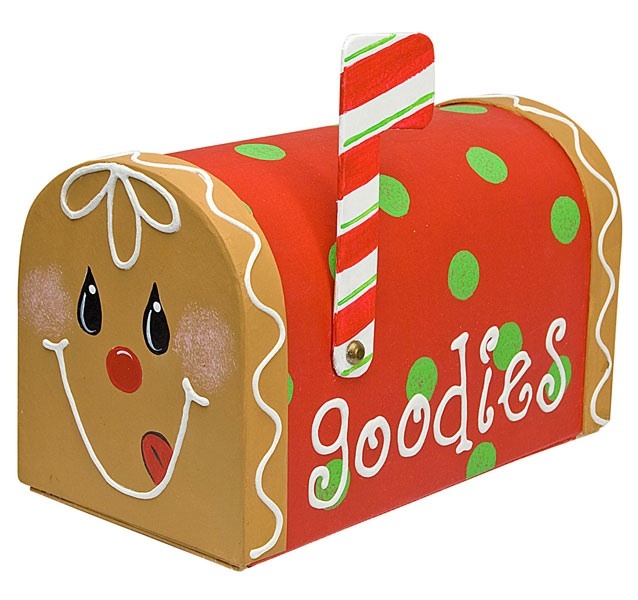 This Christmas make a DIY homemade Christmas mailbox for your goodies. This is perfect for storing all your holiday cards and greetings. It's a papier mache box that can decorate itself with paints. Use 3/4" flat brush to paint mailbox sides, Tuscan Red; ends, Cocoa; and flag, Snow White. Adjust pattern size to fit surface. Trace and lightly transfer face. Paint eyes, Lamp Black; nose and tongue, Tuscan Red. Use liner brush and Snow White to highlight eyes and nose. Outline tongue with Lamp Black. Stripe flag with Tuscan Red and Sour Apple. Use sponge pouncer and Sour Apple to stamp dots on mailbox sides. Adjust pattern size to fit surface. Trace and transfer lettering. Use Snow Writer to do mouth, hair, lettering, and squiggles on end borders. Varnish with DuraClear Gloss Varnish, allowing to dry between coats. Allow to dry between steps. I like this it is so cute.